Guess what I'm doing this winter guys? I'm redecorating my living room! I have lived in this house since 1998 and during that time this room has been re-decorated three times, and this time will be fourth and final time I redecorate this room! Now that my husband and I are empty nesters, we've been going through our home room by room redecorating and remaking the rooms suitable for this new stage in our lives. You can see more pictures and different angles on this post HERE when I first redecorated it. As you can tell by the picture, the room is very dated...in nine short years! The wall color, the drapes, the rug, are all out of style now. 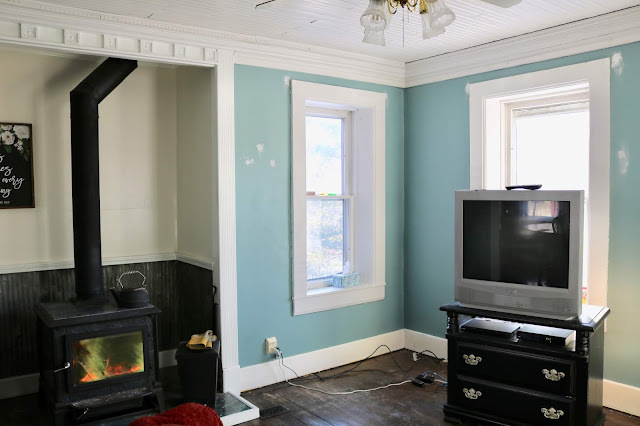 But the main reason we're re-decorating it is that the room doesn't work for us anymore, and there were some things we never did right the first time because of financial constraints: the hardwood floors are in very bad shape and the windows need to be replaced. Now, other than wanting to update the decor and fix the floor and windows, whenever I re-decorate a room I always ask myself the question "How Do I Want To Use This Room?" This is a room that is very small and comfortably only seats about two to four people, so it not used for company. We have two larger family areas for company. The main purpose of this room is a passageway to get to the third level of the house. It also holds our wood stove for the older portion of our house. I use this room only in the morning, when I'm getting my computer work done because it's close to the kitchen where I can grab another cup of coffee. I may also use this room while I am making dinner and I don't want to be too far away when something is cooking yet I don't need to be in the kitchen at all times. It's too far of a walk to go to another part of the house to sit while something is on the stove and I need to periodically check on it. And finally, during some parts of the year my husband and I need to use this room to relax in during the evening because of heating/cooling issues. For example, if it's early fall and it's too warm to use two wood stoves we only use one, the one in this room. The other part of the house is too uncomfortably cool, so we huddle down in this room. The same goes for summer; although my one window air-conditioning unit really does keep most of the main living space cool, if there is ever an extreme heat wave, I close off the door to the new addition, and only cool this part of the house. So now that you know all that "How Do I Want To Use This Room"? 1) I want a comfortable reading chair with a small table so I can sit and do my devotions and work on my computer in the morning. I must have a place for my coffee mug that's in easy reach. 2) Because this room is basically just a passageway and not used by a lot of people, I don't want it to be cluttered like it is now. I want minimal furniture, and lots of open space. I'm always keeping in mind my old age as I renovate my house room by room for one last time. I don't want anything I can trip over or so much furniture that ease of mobility through the room could be an issue. 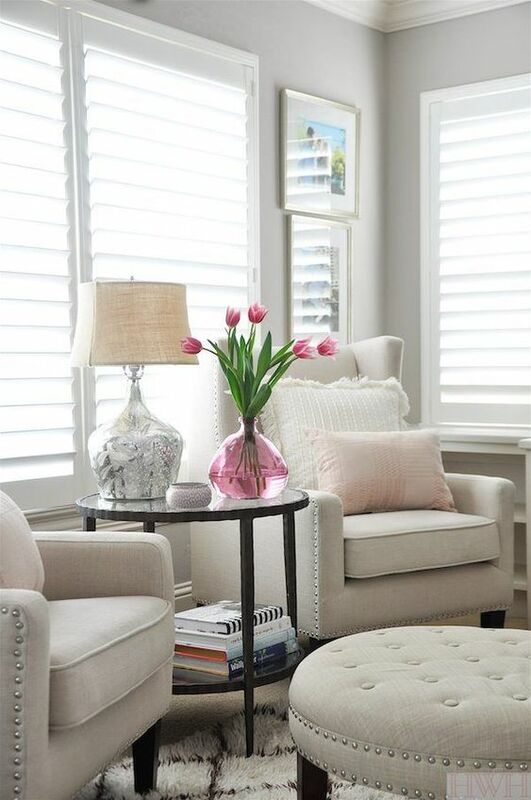 3) I want another comfortable chair or loveseat for those rare cold/hot days when my husband and I need to use this room instead of our large family room. And now, here are some "Before" shots after the drapes have been taken down and most of the furniture removed. I have already started spackling the holes in these pictures. These pictures will give you some idea of the "bones" of the room. The walls will be repainted "Colonial White" by Pittsburg Paints. 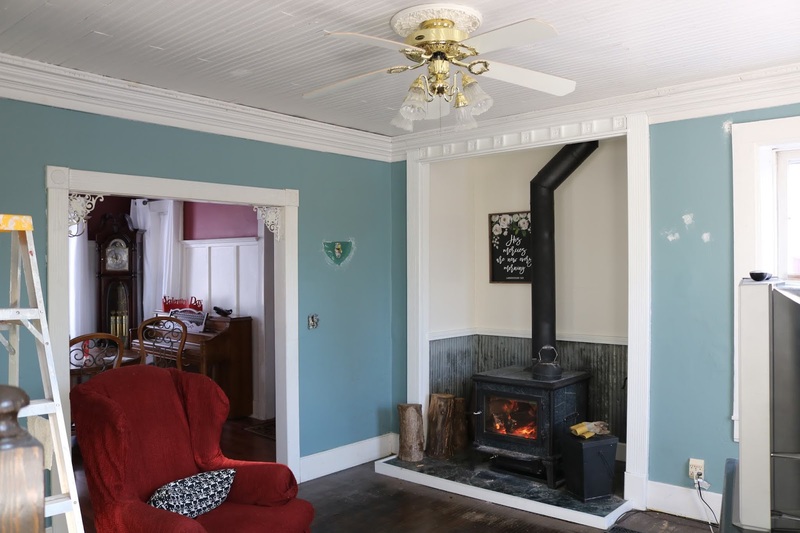 I've already repainted the wood stove alcove so you can see what the color looks like. I had to repaint that section this past summer because obviously I couldn't get near it now. The black and white chalk painting behind the wood stove will stay. Since this room is the room I have my morning devotions in, I thought it was appropriate. Plus, it matches my wood stove. 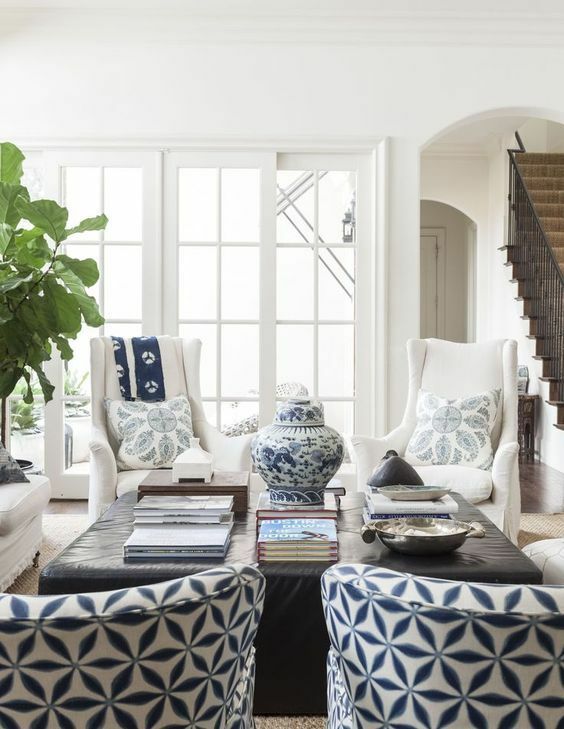 The hardest challenge of redecorating this room is furniture placement as there is little wall space, and the room is not large enough to move the furniture away from the walls. 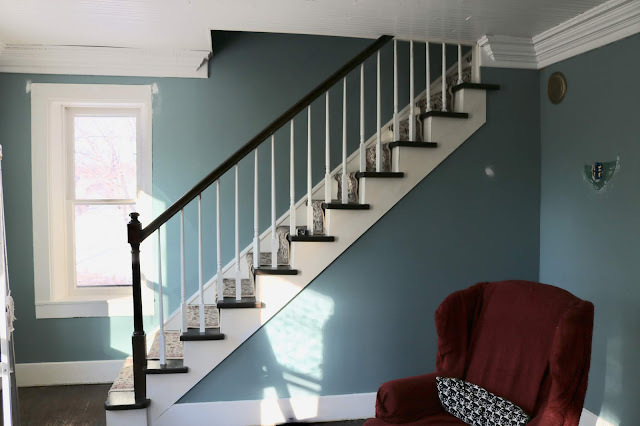 One wall is open to the dining room (which also is outdated and needs to be redone), another wall contains the wood stove, the third wall is a wall of windows, and the last wall is a staircase to the upstairs. 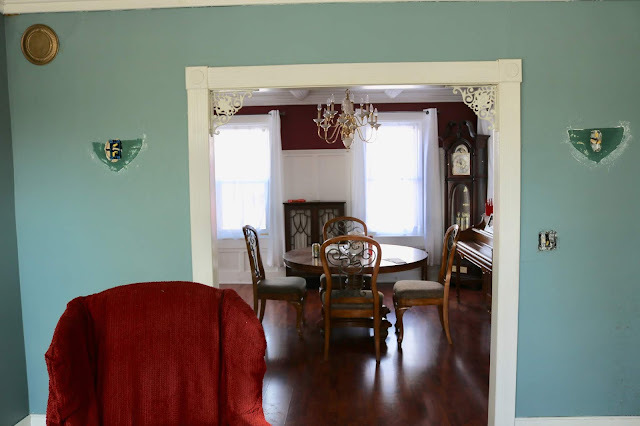 I would love to hire a designer to see what they would do with this space, as my husband and I have wracked our brains and still have yet to figure out any layouts. I am more than open to suggestions from my readers! Please comment below if you have any. There were outdated gold sconces on the wall that were taken down and will be replaced by more trendy ones. I also painted the gold chimney flute the same color as the wall so it's not so noticeable. 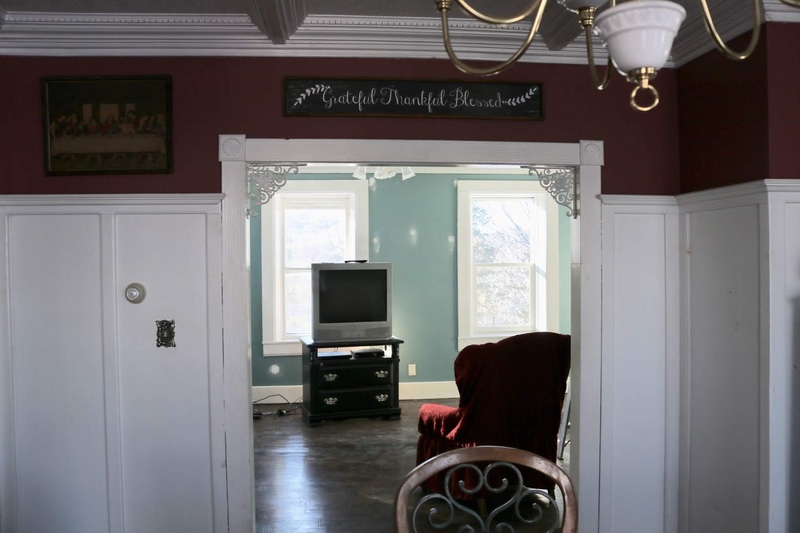 The ceiling fan will stay, even if it's a bit dated. It's needed for heating and cooling. This is the view of the living room as seen from the dining room. Occasionally we like to leave the TV on while eating, so we would like to be able to see the TV from the dining room. We will get a new Smart TV. This is the staircase wall. I'm thinking of putting my comfy reading chair in this corner with a table on the end. You can see how close the kitchen is to this room in the picture. The kitchen is actually right behind the staircase. The entry to the kitchen is right off the dining room, in the middle right side of the picture below. That is why I prefer to use this room while cooking as the kitchen is only a few steps away. Since writing this post I've given the ceiling a fresh coat of paint, and one layer of "Colonial White" on the walls. I am blown away by how much larger this room looks with all white walls. My husband and I still haven't figured out the layout of this room. I think a large part of that decision will be what furniture we can find. We will go shopping next week and maybe we will have a better idea then. In the meantime, here are some looks I love from Pinterest. Keep in mind, the space is the photos is very different than my space. The pictures are just inspired looks I'm going after. I love the idea of "his and hers chairs", and the table in the middle is great because both occupants have a spot for their drinks. I'm just not sure this style of chair would great for TV watching. These chairs look a lot more comfortable for lounging! I also love how color was brought in to the rooms with drapes, pillows, and blankets. 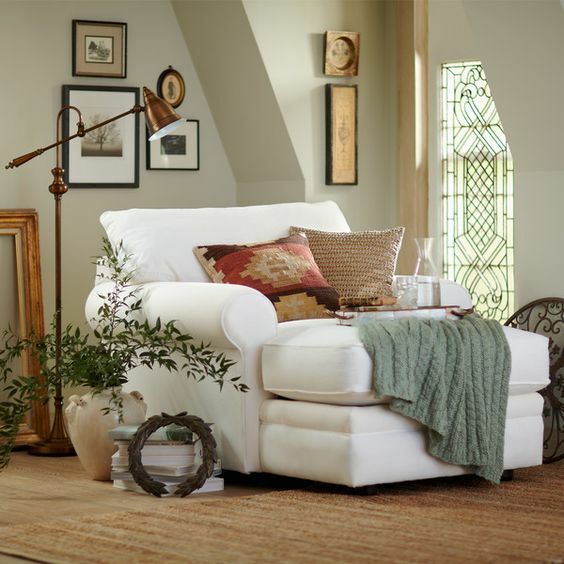 Ideally, I would love a chaise lounge for myself and just a regular chair for my husband (I'm a sloucher, and he likes to sit up straight in a chair). 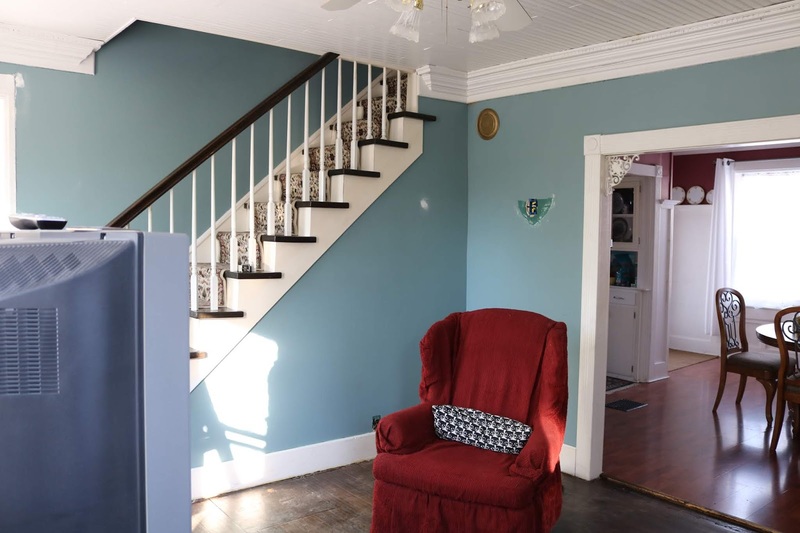 I'm just not sure a chaise lounge would fit in this small room and still allow plenty of space for a walk way to get upstairs. This room is similar to ours in that it has a staircase plus a wall of windows, but it must be quite a bit larger since they can just pull the furniture away from the walls and create a nice sitting area for four. This room is actually someone's entry hall but it most closely resembles my awkward space. 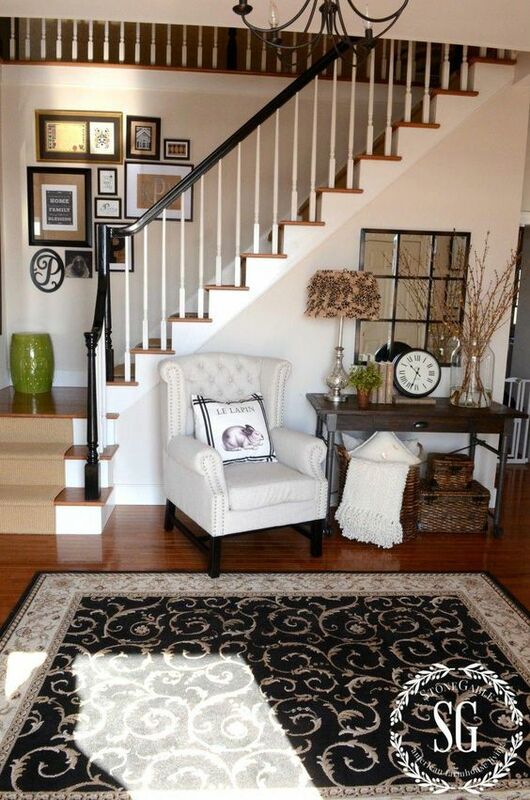 I pinned this because I liked the idea of putting the chair closer to the stair case landing and the table where there was more wall space. I never considered that option before I saw this picture. Another room with no real walls, so they pull the furniture away from the windows and doors. Isn't that light fixture fun? And I love how they are mixing furniture pieces today. I'm very open to that in my new living room. My husband and I also talked about getting a small sectional and putting it in the corner where all the windows are. We'd then add a lamp just like this behind the sectional. The problem with that idea, is the sectional would cover up the windows a bit, plus, we'd have to move the TV and it would no longer be visible from the dining room, not to mention the hassle of moving all the TV cables. So, that's probably a "no". 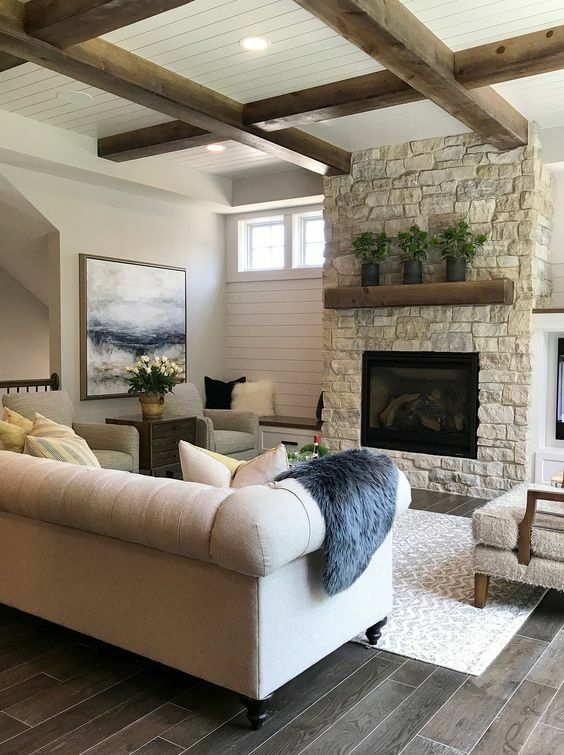 I know I don't have a gorgeous fireplace like this in my room, but I love the look and feel to this room and would love to find a way to incorporate it into my room. So now that I've shown you the room "Before" and given you a few pictures of the "Look" I'm going for, what do you think? Is it possible? Or am I only dreaming? I'd love to hear your thoughts and ideas in the comment section below. I will post weekly updates on the room as it progresses, so come back every Sunday to see more! Your inspiration pins look great Amy and I do believe you can do something similar in your room as well. Even though it might be a bit challenging project to begin with, it sounds like a lot of fun, and I am sure the end result will be really beautiful! Thanks so much for the support Ellie! These are so lovely dear. Really cozy inspirations you have here. Thanks! I hope we can make the room as lovely as some of the pictures. What lovely space you are going to create. I like the way you asked yourself how you want to use this room, and then have begun basing your design choices on that. We have a 'formal' living room that we are rarely in. Someday, I would like to lighten up the decor in there and make it a place where we can read and talk and just be together. Thanks Leslie. Yes, a lot of empty nesters go and buy a new house, we're just renovating ours to make it more suitable for our needs in our twilight years. I love seeing a space transform into something new. It's such a fun process! It's amazing how quickly things go out of style, isn't it? You've got some great ideas, and I can't wait to see what you do with this room. Thanks so much for sharing at Sweet Inspiration!